So critic Paul Kincaid took on a commission to write a review of this year's crop of best SF&F anthologies, and was dismayed by what he saw. And after his review began to cause a bit of a stir, he amplified his thoughts in an interview, published in two parts. It's all good, useful stuff. Paul Kincaid is sincere, insightful, and very careful about articulating exactly what he means. He's very careful, for instance, to point out that he doesn't think that SF is a dying genre. But he does think that it is exhausted. That it has reached a point of crisis. That it has lost confidence in the future - or in presenting comprehensible futures. Undermined by the feeling that 'the present [is] changing too rapidly for us to keep up with', it has reeled backwards, producing thinly-imagined futures based on unexamined second-hand furniture lifted from older sf. Stories in which most of the sf tropes are mere decoration that if stripped out wouldn't much change the plots, and most of the science is based more on magical thinking than on actual cutting-edge research. Like every genre, sf has always mined its past, of course, but Kincaid senses something new: a lack of passion. A lack of edge. Of danger. Way back when, when I was writing Eternal Light, when the whole 'Radical Hard SF' and 'New Space Opera' thing was kicking off, I was part of a bunch of writers who, along with Interzone editor David Pringle, felt something similar. If you were going to reuse the old tropes, we thought back then, you shouldn't take them at face value. You should strip out their guts and rebuild them from the ground up. You should weld in the new biology, the new physics, the new cosmology. Punk it up. I still think that. The internet makes it much easier to keep up with what science is doing now (twenty years ago, I was working in a university, so unlike many of my contemporaries, I had a whole library of scientific literature to draw on; now, much of that stuff is just a few keystrokes away). Ditto cutting-edge fashion, architecture, information technology . . . The future is unfolding all around you, right here in the happening world of the present. But as Kincaid points out, the present isn't a comfortable place, right now. Which is perhaps why too many sf writers recoil from it, into cosy futures from days past. And there's a professionalism in the genre now that wasn't much in evidence twenty years ago; perhaps people aren't inclined to take risks that might affect their brand. It's certainly harder to publish a different kind of novel, every time, than it once was. And let's face it, twenty years on, it's possible that I've become part of the problem. I'm not sure what my 'brand' is, let alone how to nuture it, but it's possible, yes, that I've grown lazy and complacent. That's why critics like Paul Kincaid are useful - to ask hard questions, to point out uncomfortable truths. That's why we should take them seriously. That's why, if they point out a problem, we shouldn't react defensively, but try to figure out how to solve it. How to do better, next time. Which is kind of where we came in. Two new books. On the left, the mass-market paperback of In The Mouth Of The Whale. Which is not a sequel to The Quiet War and Gardens of the Sun, but shares the same future history, and conflates the childhood of a character from those novels, the gene wizard Sri Hong Owen, with what happens to her when she arrives, after a long and difficult voyage, at the star Fomalhaut. It is published on October 11th. On the right, the mosaic novel Zombie Apocalypse! 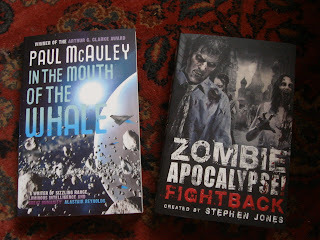 Fightback, which is, most definitely, the sequel to Zombie Apocalypse! In the first novel, a zombie plague spreads after the tomb of an eighteenth century architect, Thomas Moreby, is disturbed; in the second, the human resistance begins to organise itself against the plans of Moreby and his undead army. It's published on October 4th in the UK, and November 1st in the US; the table of contents can be found here. *Not really. But it would nice if you did.